Although we have covered suspenders in great detail in our suit guides, we had yet to review any brands in particular. This was about to change when we were approached by JJ Suspenders in late December last year. Despite not being familiar with the brand, their philosophy sounded promising with a firm belief in crafting traditional English-made braces with contemporary designs for the British market. Founded in 2014 by Jackson and Josh, JJ Suspenders is joint-venture to modernise the market for braces. When searching for suspenders to wear for a friend’s wedding, they were disheartened by the limited and outdated selection available. Furthermore, they discovered that many of the cheaply-made online braces came from the same factory. Meanwhile, they stumbled upon a traditional English manufacturer but found that shipping costs rendered them inaccessible. Consequently, Jackson and Josh sought to create JJ Suspenders in order to offer stylish yet affordable high-quality suspenders to customers in USA. In their words, they endeavour to bring “some much-needed innovation back into this stagnant industry”. Today, JJ Suspenders offers a rich selection of braces for men, which are divided into three style categories, which you’ll learn about below. In this review, you’ll learn more about both the styles and designs that they offer as well as the manufacturing quality. Each pair of braces are delivered in a slim box in either white or black with a faux-leather effect. The suspenders themselves are neatly folded around a piece of cardboard. Underneath, you’ll find spare metal clips as well as a sewing kit for adding any buttons to your trousers. The latter is a particularly intuitive attention to detail and a nice touch. I’m not overly fond of metal clips so I was delighted to see some effort made to encourage using buttons instead. Even if you’ve never sewn anything in your life, retrofitting trousers for suspenders is easy. In fact, you can learn how to do it with our full guide on retrofitting trousers for braces. Additionally, it was great to see that all their braces are designed so that they can be both attached by buttons or clips. I have had many moments of disappointment to find a suspenders design that I like only to learn that they can only be clipped onto trousers. Being specialists, it’s no surprise that JJ Suspenders have crafted a rich selection of braces that are divided into three or four categories. I realise that this sounds ambiguous but this is because the fourth category is dedicated to leather suspenders. Although a somewhat niche market, leather suspenders have recently experienced something of a renaissance. In fact, they’re a particular favourite for some for pairing with jeans. Similarly, JJ Suspenders retail skinny suspenders, which are similar to their classic line in construction but are 0.4 inches thinner. However, we tend to favour wearing our braces formally at Bespoke Unit, so we’ll be concentrating on the remaining categories. These consist of their so-called classic suspenders, which are 1.15″ wide as well as their formal 1.5″-wide suspenders. 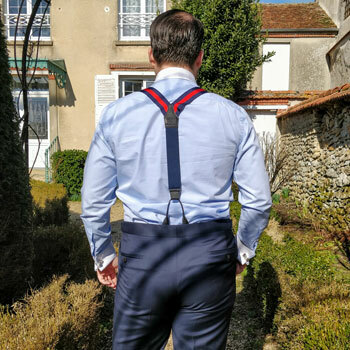 Aside from the differences in width, the classic and formal suspenders feature different fabrics and construction. 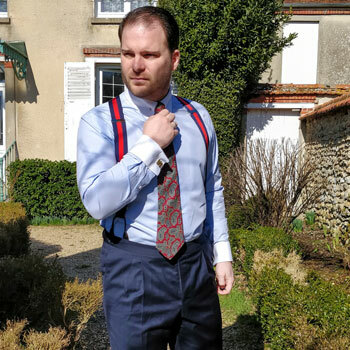 While the classic suspenders are made from fabric that’s been folded and sewn like a necktie, the formal suspenders are a single layer of fabric. Specific fabrics have been chosen according to the desired appearance. For instance, the formal suspenders are 100% polyester ribbon so they stay form and avoid wrinkling. Meanwhile, the classics are made from cotton for a modern aesthetic. Consequently, the they are visually thicker with a more casual effect. 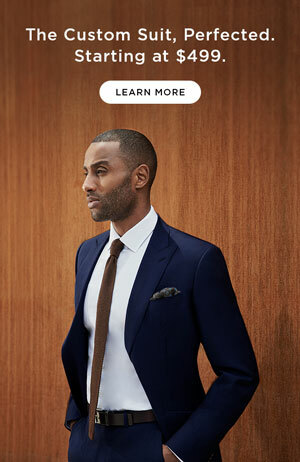 Meanwhile, the formal suspenders are wider but also thinner, which creates a more streamlined appearance. There’s a rich selection of colour schemes available, which is always a burden for the indecisive like myself! From contemporary patterns and motifs to conservative block colours, there’s an option for everyone. For those looking for suspenders that standing out, there are polka dot and spotted options in the formal range as well as floral motifs among the classics. Meanwhile, I prefer block colours or thick stripes on wider suspenders. This is because I want my braces to accent my style rather than be a centrepiece. 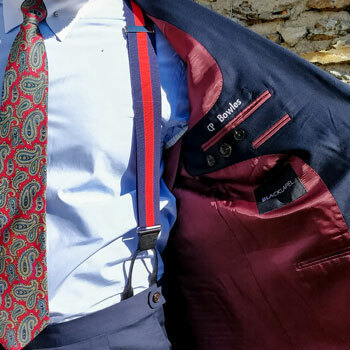 Therefore, I opted for the “Cherry Bomb” formal suspenders (navy and red stripes) as well as the classic “Fine Wine” burgundy suspenders. However, I also received a brown and olive pair from the classic range to offer more comparison. JJ Suspenders claim that their braces are made with nickel and chromium buckles as well as hand-stitched full-grain leather. While the classic suspenders are quite soft and embrace the shoulders without too much pressure, the formal ones are sleek and weightless. All of JJ’s styles are made using a Y-back design. Here, the lower portion is made from an elastic fabric that stretches when moving. This is quite common of suspenders and prevents them from feeling to constricting. Usually, the lower portion is something of an afterthought but here the colours are carefully considered. 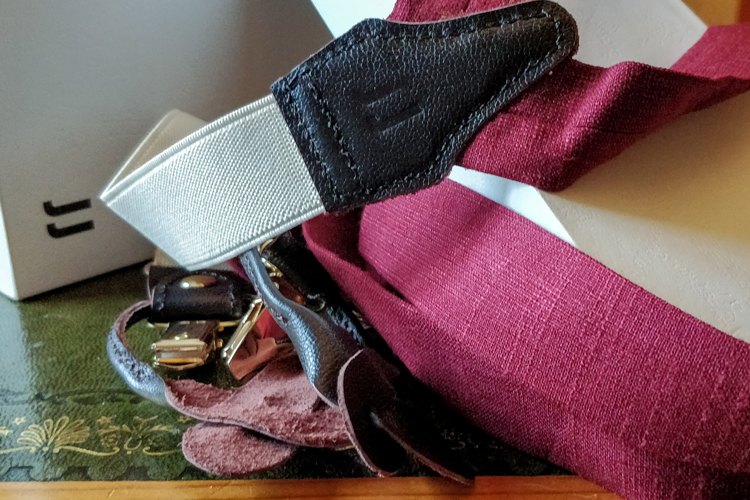 For instance, the burgundy classic suspenders feature a cream elastic, which offers a nice contrast. Meanwhile, the blue and red striped formal suspenders provide a navy coordination. Finally, the leather details are quite well made too. The button loops are made from full-grain leather in either black or dark brown, which can help in coordinating your outfit. As for the centre back panel, it’s made from a matching leather with a “JJ” stamp in the middle on the classic suspenders. As for the formal ones, the back panel is made from two separate pieces of leather. Their older, UK-made suspenders may even feature a Union Jack tag. I admit that I do find JJ Suspenders to be a little expensive for what they claim to offer. Nevertheless, you can benefit from a 15% discount with our exclusive code, “BESPOKEUNIT2019” when checking out. Similarly, JJ Suspenders no longer manufacture their braces in the UK. When we reached out to them, we were told that they now work with a “reputable factory” in China to produce their suspenders. JJ Suspenders went on to explain that they regularly visit the facility and work with an American-based quality assurance company. However, JJ Suspenders does indeed host a rich selection of braces with various designs and offer reliable quality. Therefore, it’s probably worth the investment as you can be sure what you’re getting. After all, it’s true that buying the right suspenders is challenging to say the least. There are many options out there but most are often cheaply made in large factories with little consideration for quality and aesthetics. Due to the limited availability of quality and attractive suspenders, JJ Suspenders has something good going. Hopefully, they’ll blossom in the age of the internet and I look forward to seeing the brand grow. Nevertheless, it’s just a shame that they no longer work with the century-old English mill as they used to advertise. Reviewed by Charles-Philippe, on 8th February . "Reliable quality and stylish designs. Although somewhat expensive, JJ Suspenders do offer great quality and contemporary braces for the modern gentleman."